This MOD decrease enemy bow damage. I thought the enemy's bow attack is too strong. So I make the MOD. You should choose one esp and activate it. There are 3 kinds of esp files in this MOD. This is the mild version of "Decrease bow damage". This esp file has simple effect. All NPC lose the bonus of "Extra Damage" to their bow attack damage. So you wouldn't be killed by an arrow unfairly any more. But this MOD doesn't weaken the guard's perks incompletely. Because their shot is the penalty of the crime found. Now, enemy's bow attack is not stronger than any other weapons. This is the expert version of "Decrease bow damage". This esp file has two effect. 1: All NPC lose the bonus of "Extra Damage" to their bow attack damage. 2: You can get 20% resist damage bonus to enemy's bow attack. But you also get 50% damage penalty to your bow attack. This edition was made for true swordmen or wizard. If you wish to decide your battle by the sword or magic , you'd better choice the esp. Archers would be demoted to the subsidiary position in the battle. This is the powerful bonus version of "Decrease bow damage". You can get the bonus equal to "Blade world.esp". But you don't get any damage penalty like it. 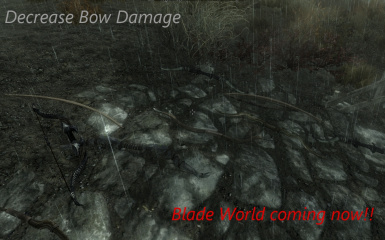 New esp file "Decrease Bow Damage -Invincible.esp" added. This is the powerful bonus version. You have to only de-activate the esp.